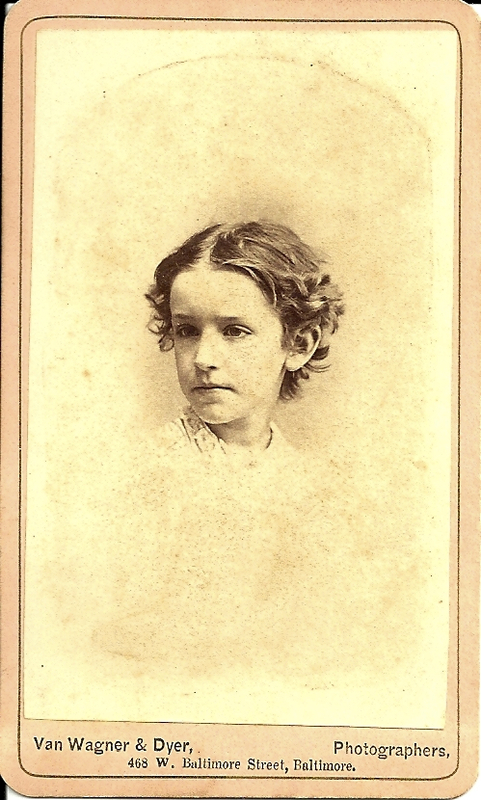 This delicately side-lit carte de visite vignette of a very young Eliza Robinson Lloyd is one of the photographs sold from a Talbot County collection containing many card photos from the Chaplain family. Eliza Robinson was the daughter of James Lowrey Robinson and Sarah S. Chaplain. Eliza (b. abt. 1860) , whose nickname may have been “Lida,” married Trappe farmer Charles B. Lloyd in 1883, when she was 23 years old. Eliza and Charles had two children: Helen Lloyd and Charles Francis Lloyd (b. 1887, Easton or Trappe, Talbot County, Md.) Charles became an electrical engineer for Westinghouse in Pittsburgh. Helen remained single and lived in Easton with her parents. Sarah Chaplain, Eliza’s mother, was the daughter of James Chaplain and Eliza Stevens. Sarah likely grew up in the small Talbot County village of Trappe. Her brother, Dr. James Stevens Chaplain, is the subject of an earlier post (see archive). Both the Robinson and Lloyd families were Trappe neighbors to the Chaplains. Charles Lloyd was the son of Trappe physician and farmer Dr. Francis M. Lloyd. Ross Kelbaugh’s directory dates the Van Wagner & Dyer studio at 468 West Baltimore Street to 1871. That would make Eliza 11 years old at the time of her portrait, but she looks a little younger.